Oyster Company ledger first date 23 February 1932 - it lists agent as Furness Withy & Co.
Dundee Evening Telegraph 18 Feb 1932 reported BERWINDLEA has sailed (from Dundee) for Tollesbury to be laid-up. She had been in port almost a month to discharge sugar and for repairs. Voyage Record Cards give 19 February 1932 River Blackwater. 3 July 1935 London. It is not clear how this entry relates to another BERWINDLEA reported in the River c1928. Voyage Record Card first entry for BERWINDLEA is 31 July 1929 Glasgow. 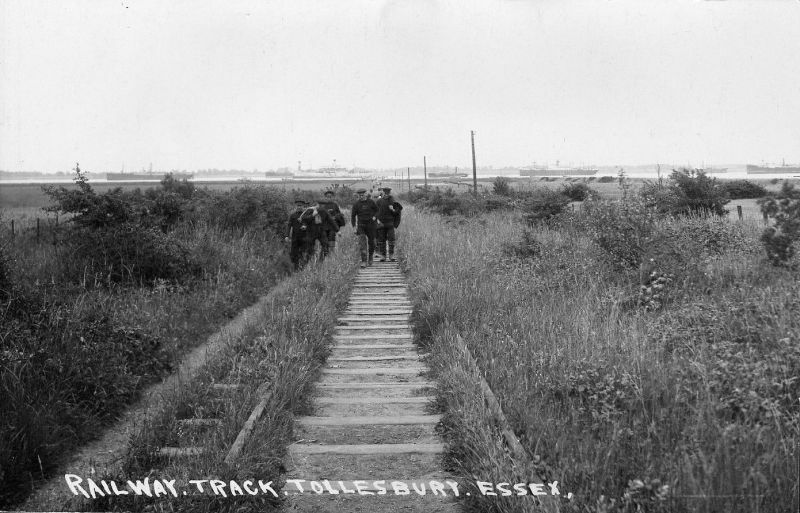 Above: Railway Track, Tollesbury, Essex. Used in "More from Tollesbury Past" by Keith Lovell, which says: "The obsolete track to Tollesbury Pier Station is overgrown. Ships are anchored in the Blackwater during the depression. Stretching back towards the river, Tollesbury Oyster Company men return home from work. In these hard times they received one pound a week with which they were able to buy their winter coal. The second ship from the left is probably the HIGHLAND ROVER which was ... Date: c1933.